Bins for the under storage area. Thankfully we closed on the house last week. Everything seemed to go as expected. We are still local, staying in a nice RV Park while we finish up some business details and my and our furry 13 year old pup, PJ’s final doctor/vet wrap-ups before we hit the road. We hope to head toward Texas next week, but things keep popping up that make it hard to get away. Life still happens in an RV, no getting around it. I had to have some unexpected dental work done, leaving me on a liquid diet for a while. Then someone hit our truck at the mall parking lot doing a small amount of damage to the bumper and fender (if $1400 is small). Fortunately they left a note and their insurance should cover it and we are hopeful to get it repaired before we leave town. We are not immune to life’s mishaps, ups or downs. We just have different scenery to view as we deal with it. We have started our round of good-bye dinners with dear friends and family. We love them so and will miss them terribly. But the alluring dream of travel calls…….I don’t think that many folks knew we were this adventuresome and most are very shocked (but supportive of our dreams) that we actually are on the way to it happening. I am not sure that we realized we were this adventuresome either! It won’t be forever, just for a fun while. We are however ready to get on with it, but being responsible, we must get a few ducks in a row first. The move out of the house was a physical challenging nightmare. Remember we were not moving to another house, but getting rid of nearly everything, in about two weeks! We sold things on Craig’s List, moving/yard sale, gave them away to family and friends and donated a lot. The items that we stored are strange: some art work, travel trinkets, a treasured keepsake from each of my grandmothers, Aunt and friends, family photos of several generations and our genealogy files. How does one put a price on these precious items? We will have to see how long we will store these things and hopefully find a home for them within the family. 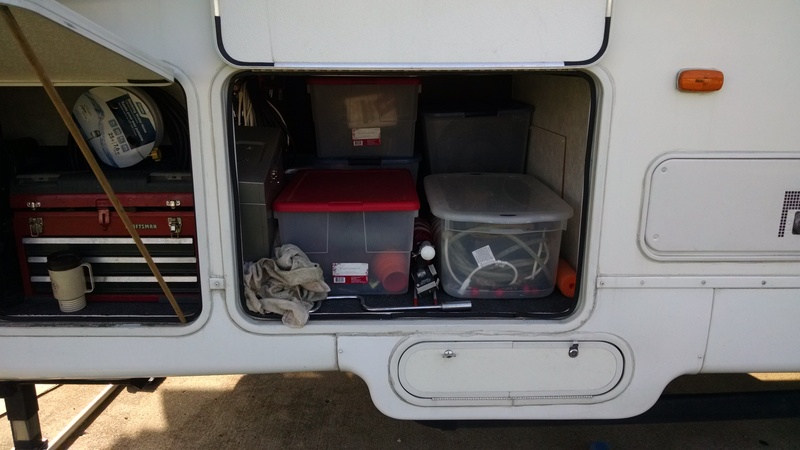 So mostly what we own is in the RV and truck! We find that we have everything that we need and ” in it’s place “. We will face each new situation as it comes. Our PJ is adjusting far better than we expected. He just wants us all to be happily together. We agree, life is best that way. “Postpone Nothing”. If you get a chance read home sweet anywhere. We are looking forward to your blogs and hope to take off on our adventures after I retire. Maybe next spring?? We will head for Texas where our kids, grandkids live someday. Hope we can catch up with you someday. Take care and be safe. Looking forward to a meet-up somewhere, sometime down the road!